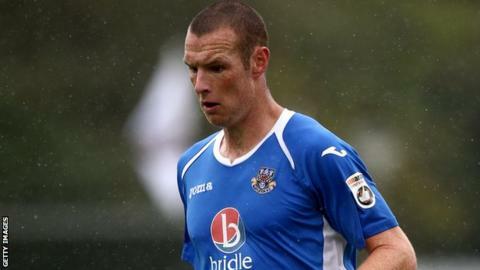 James Constable scored a second-half winner and was sent off as Eastleigh pulled off a shock victory away at high-flying Tranmere Rovers. Rovers dominated the first half, keeper Ross Flitney saving Andy Mangan's penalty and making several other stops. But Joe Partington headed the Spitfires ahead from Jai Reason's cross before Tranmere had Lois Maynard sent off. Constable's spot-kick made it 2-0 and the visitors held on despite Constable seeing red and a Steve Jennings goal. Jennings tapped in James Norwood's cross to give Tranmere hope but Eastleigh hung on for victory. Match ends, Tranmere Rovers 1, Eastleigh 2. Second Half ends, Tranmere Rovers 1, Eastleigh 2. Liam Ridehalgh (Tranmere Rovers) wins a free kick. Jai Reason (Eastleigh) hits the woodwork with a left footed shot from outside the box. Attempt saved. Yemi Odubade (Eastleigh) right footed shot from outside the box is saved. Josh Payne (Eastleigh) is shown the yellow card for a bad foul. Foul by Josh Payne (Eastleigh). James Norwood (Tranmere Rovers) wins a free kick. Attempt missed. Adam Mekki (Tranmere Rovers) header from the centre of the box is too high. Goal! Tranmere Rovers 1, Eastleigh 2. Steven Jennings (Tranmere Rovers) left footed shot from the centre of the box to the bottom right corner. Assisted by James Norwood. Martin Riley (Tranmere Rovers) wins a free kick. James Constable (Eastleigh) is shown the red card for violent conduct. Jay Harris (Tranmere Rovers) wins a free kick. Attempt missed. Jay Harris (Tranmere Rovers) right footed shot from outside the box misses to the left. Substitution, Tranmere Rovers. Liam Ridehalgh replaces Adam Dawson because of an injury. Substitution, Tranmere Rovers. Adam Mekki replaces Marlon Jackson. Andy Mangan (Tranmere Rovers) wins a free kick. Substitution, Tranmere Rovers. Steven Jennings replaces Ritchie Sutton. Offside, Tranmere Rovers. Matthew Hill tries a through ball, but Matthew Hill is caught offside. Goal! Tranmere Rovers 0, Eastleigh 2. James Constable (Eastleigh) right footed shot from the right side of the box to the high centre of the goal. Assisted by Ross Flitney. Offside, Tranmere Rovers. James Norwood tries a through ball, but James Norwood is caught offside. Offside, Tranmere Rovers. Marlon Jackson tries a through ball, but Marlon Jackson is caught offside. Liam Hogan (Tranmere Rovers) wins a free kick. Lois Maynard (Tranmere Rovers) is shown the red card for a bad foul. Dan Harding (Eastleigh) wins a free kick. Goal! Tranmere Rovers 0, Eastleigh 1. Joe Partington (Eastleigh) left footed shot from the centre of the box to the top left corner. Assisted by Jai Reason with a cross.